State Rep. David Leland speaks to the patrons of the Fayette County Democratic Party Executive Committee Obama Legacy Dinner Sunday evening. He is pictured with executive committee chair Judy Craig. 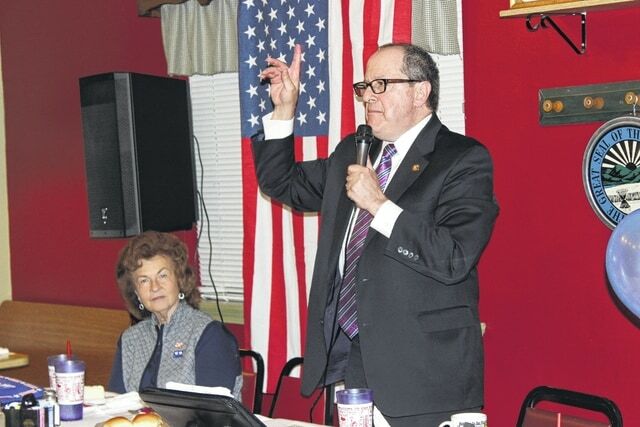 The Fayette County Democratic Party Executive Committee held its annual Presidents’ Day dinner Sunday at Our Place Restaurant in Washington C.H. With around 70 people, the Democratic Party dinner, this year named the “Obama Legacy Dinner,” was well-attended on a beautiful Sunday evening. The event began with an auction of various items, including President Barack Obama memorabilia such as 2008 election posters, plates featuring United States Presidents, mugs, bags, books and many other items. Dinner was served and included either chicken or steak with mashed potatoes and green beans. The patrons enjoyed the meal and thanked the waitresses and cooks for their service. Following the meal, the guest speaker State Rep. David Leland, the former Ohio Democratic Party Chair who currently serves Ohio House District 22, took the microphone to deliver his rallying speech. Leland began his speech by talking about President Trump’s first 30 days in office. When talking about the challenges facing Democrats today, Leland made an historical comparison. He said that he knows from history a time when General George Washington was losing men by the dozens and yet went on, knowing that he had nothing left besides the Republic to hope for. Leland compared current situations to the Civil War as well, and asked if not for the brave men from Ohio at the Battle of Gettysburg, where would our nation be today? He said that was their time and now it is our time. “That was their time, that was their issue,” Leland said. “This is our time, this is our issue. What we are doing today may be not as onerous as that. Nobody is asking anyone here to give the last full measure to protect their country. But the battles we are fighting and the things we are protecting are every bit as important. Some people will say, ‘Okay Dave you are getting a little carried away, things are not that bad.’ And my answer to that is perhaps, and I hope so. But you don’t know what is going to happen at the end, in the beginning. You don’t know how it is all going to come out and you don’t lose something like a country or a republic at the first blast, in the first 30 days. You lost it because one thing after another happens and nobody says anything about it. “What concerns me is that we have an ongoing assault on our Republic, on the freedom, justice and liberty that we have all come to know and love in the United States of America,” Leland said. “When 1,000 digital operatives from Russia work with members of the opposing side to try to influence an election for the President of the United States of America and the only reason that the person gets fired from the National Security Council for having these conversations with Russia is because he lied to the vice president…when these kinds of things happen during the election of a president, this is an assault on our Republic. https://www.recordherald.com/wp-content/uploads/sites/27/2017/02/web1_IMG_3277.jpgState Rep. David Leland speaks to the patrons of the Fayette County Democratic Party Executive Committee Obama Legacy Dinner Sunday evening. He is pictured with executive committee chair Judy Craig.